If you listen to many tech podcasts or read many tech blogs, you’ve undoubtedly heard or seen ads for Squarespace, the WYSIWYG, cloud-based Web site hosting service. The ads promote Squarespace as an easy-to-use, gorgeously designed, trouble-free experience that offers additional controls for advanced users. When it came time to start my own personal Web site back in August 2012, I decided to take the plunge with the then recently released Squarespace 6. If you’re looking for an easy way to start a Web site that doesn’t require gobs of technical knowledge or system administration, Squarespace is worth a look, particularly for those who want cutting-edge design and easy, cloud-based management. However, power users may grow frustrated with its lack of complete control and lack of good Mac- and iOS-based management tools. It’s still a young platform, and thus immature, with constantly changing features and unresolved bugs. Should Squarespace not be your cup of tea, there are plenty of alternatives, ranging from Mac-based Web authoring software like Sandvox, RapidWeaver, and Freeway to simple Dropbox-based systems like Calepin (see “Calepin: Simple, Minimalist Blogging with a Twist,” 5 January 2012 and “Calepin Redux: Minimalist Blogging Platform Goes Open Source,” 26 June 2012), and mature platforms like WordPress (see “WordPress as an Alternative to iWeb,” 21 November 2012). Signup and Initial Setup — Squarespace offers a two-week trial, with no credit card required, which makes it easy to try out. One of the things that you notice about Squarespace right away is that like Apple, Squarespace is design-oriented. Before you even establish a login, you’re asked to select from a number of templates. They are all quite nice, and based on responsive Web design, which means that the site should adapt to the reader’s screen size, so it looks equally good on an iPhone or a MacBook Pro with Retina display. Most of the templates are intended to either be used as a blog or as a portfolio. You can use a blog as a portfolio, or vice-versa, but you might encounter overlapping content or other issues. After you’ve picked a template and created a login, you’re presented with the Squarespace configuration page, with some helpful tip bubbles to guide you. If you change your mind later, you can redesign your site on the fly. Your template customizations are saved, so even if you switch templates, your customizations aren’t lost. If you just want to play with another template without modifying your live site, you can preview the template and make changes. Even the changes you make to a template preview are saved, so if you do decide to switch templates, your customizations will already be in place. Interface — Squarespace’s configuration page has four sections: Preview, where you see how your Web site will look; Navigation, where you manage your site’s pages; Activity, which contains your site’s visitor statistics; and Settings, where you configure site options. The Preview button takes you out of the configuration page, displaying an editable preview of your site. A control box in the lower right lets you make changes. Click the pencil to enter Edit Mode. In Edit Mode, each element is surrounded by a box, and you can click an element to go to its associated configuration page. Click the paint brush to show a sidebar that lets you change the style of your page, including colors, typefaces, and other template options. You have a wide array of fonts to choose from, including standard Web fonts, Google Web fonts, and now, over 65 Adobe Typekit fonts. You can even add custom CSS to fine tune the look. When you’re finished tweaking your design, click the X in the control box (or tap the Esc key on your keyboard), then click the gear in the control box to go back to the configuration page. The Navigation page is where you’ll spend the majority of your setup time. Here, you can create, delete, and reorder your site’s pages. Adding a new page is as simple as clicking the plus button, and you can drag pages around to reorganize them. To link a page into your live site, drag it into your site’s navigation bar. Or just keep it unlinked until you’re ready to make it public. You can create a static page, a photo gallery, a blog, and, for navigation, folders and links. Folders appear as drop-down menus containing links to the pages inside the folders, and links are just links to other pages, or to things like your RSS feed. Once you’ve created a page, to edit it, click it in the sidebar. Every Squarespace page is constructed of one or more content blocks, each of which can hold a different type of content, including rich text, Markdown text, images, galleries, audio, blank spaces, and even Amazon items. Adding a new type of content to a page is as simple as clicking Add Block, selecting the desired kind of block, and dragging it onto the page. Of course, there’s more to managing a Web site than what you show your visitors. And when it comes time to count those visitors, the Activity page is great. Unlike some analytics that update only once a day, Squarespace’s statistics are real-time. You can see how many page views and unique visitors your site has had, what your most popular content is, who’s linking to your site, and even what people are searching for to find you. Squarespace’s Activity page isn’t as in-depth as something like Google Analytics, but it’s faster and easier to use. If you want more statistical goodness, you can use Google Analytics in addition to Squarespace’s statistics. Finally, the Settings page offers a smorgasbord of configurability. You can, of course, set simple things, like your site’s title and favicon. But you can also link your site to an Amazon Affiliate account so clicks on Amazon content blocks, if they result in sales, generate kickbacks for you. You can link to a Disqus account if you’d prefer their commenting system. You can link your site to social networks like Twitter and Facebook to post notifications automatically whenever you update the content. You can even change the URL scheme, or inject custom code into the header or footer of your site. Content Management — Once you’re happy with your site’s setup, you probably won’t mess with it again for a while. What you care about is managing your site’s content. 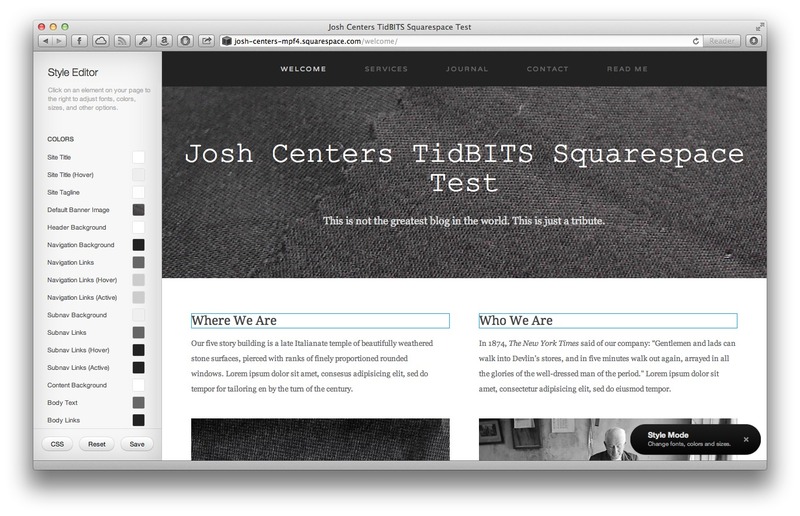 For many people, including me, the primary use of Squarespace is blogging. Starting a blog is as simple as adding a blog page in the Navigation page, and you can even set up multiple blogs on one site. To manage a blog’s contents, click on the page in the left-hand menu. The right pane displays all your existing posts and the tools to manage them. Click Add Post to start a new blog entry. Like everything else in Squarespace, a blog post is composed of blocks. (Blocks, squares, Squarespace. Get it?) By default, Squarespace starts you off with a rich text block. You can change this default to a Markdown block, which is my preference. Unfortunately, this setting doesn’t always stick, and Squarespace gives me a rich text block anyway. However, text blocks are easy to delete. Just click inside the block and click the trash can in the pop-up menu. You can then add a new Markdown block with the plus button. Speaking of deleting content, every Squarespace template includes a bunch of example content to give you an idea of how it looks and what you can do. When you’re ready to get rid of it and add your own, you don’t have to delete things one at a time. While in your blog’s page, there’s a trash button at the bottom of the screen that lets you delete all the example content. Squarespace has nailed working with photos and photo galleries. 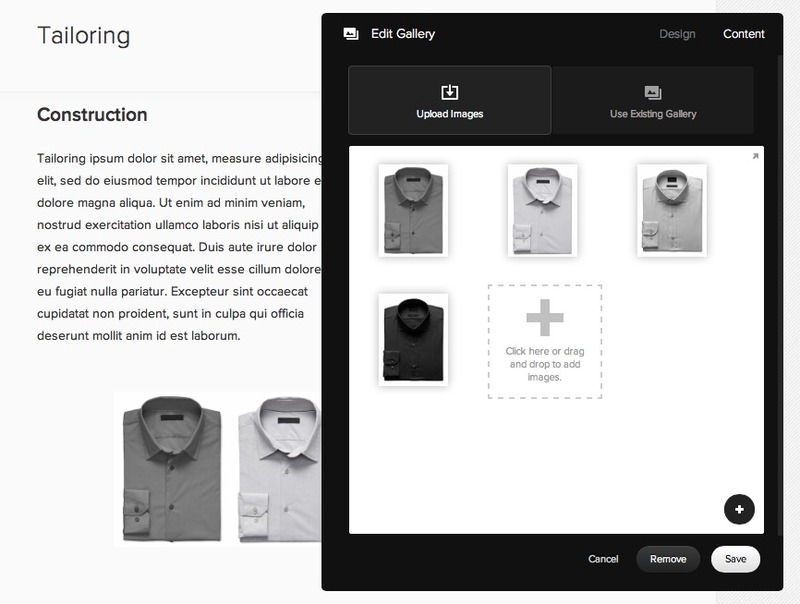 You can add a photo or gallery block to any page on your site, even inside of a blog post. From there, add photos by dragging and dropping them into the block, from the Finder or from within iPhoto. Your photos can be edited right in Squarespace’s interface thanks to the photo-editing service Aviary. You can also set a caption, change the filename, link the picture to a URL, or enable a lightbox for that photo. If you link a Dropbox account to Squarespace, you can add photos to your site by dragging them into a folder on your Mac. Given the company’s design chops, it’s not surprising that Squarespace has taken the headache out of retina-izing your site. Squarespace 6 supports images up to 1500 pixels wide, and automatically creates six different sizes to adapt to any device. My own site, which I made no effort to retina-ize, looks great on the MacBook Pro with Retina display. You can add as many blocks as you like to a blog post, and rearrange them however you see fit. When you’re satisfied, you can add tags and categories, tie the headline to an external link, and add location data, among other options. You can save your post to preview first, and publish it when you’re ready. As previously mentioned, you can automatically announce new posts to popular social networks. However, the automatic sharing doesn’t always work right. Sometimes a tweet will be sent, but the entry won’t publish to the blog. So for my own workflow, I publish and then manually share a link on social media sites. Squarespace isn’t just for personal blogs. You can add extra logins with limited permissions for guest posters or for a group blog. Nor are you stuck with Squarespace, as you can import and export WordPress blog posts via XML files. If you’re currently on WordPress but considering a switch, you could even use this feature as a long term test of Squarespace, by posting to your existing WordPress blog, exporting from that, and then importing into a shadow Squarespace site. However, the translation isn’t always smooth. Stephen Hackett of 512 Pixels attempted the switch in August 2012, but had to revert to WordPress because his custom permalinks were not translating correctly, breaking links to his site. Yet his use case is a bit unusual. 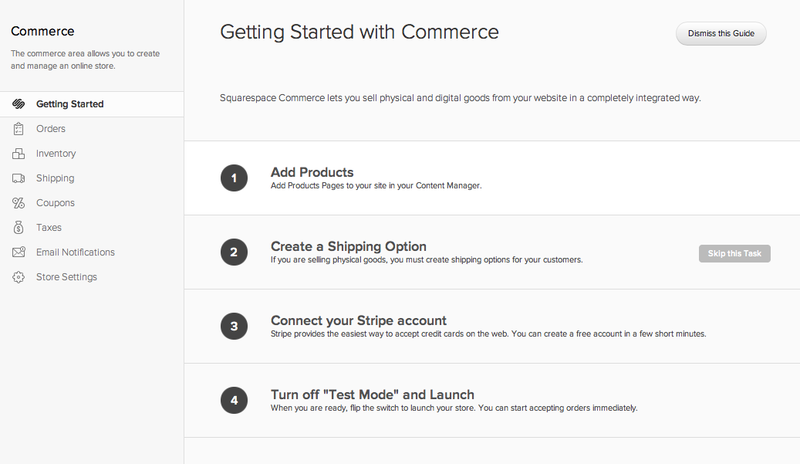 Hopefully, Squarespace will support imports and exports from other blogging platforms soon. Podcasting Features — One of Squarespace’s best features is its capability to host podcasts. Anyone who has dipped a toe into the podcasting world knows how expensive bandwidth can be, so the fact that a significant amount (500 GB at the base level) is included at a low monthly price is compelling. Starting a podcast is as easy as inserting an audio block into a blog post. Visitors can play the embedded audio directly on your site, or, if you want to reach a larger audience, Squarespace lets you add iTunes metadata tags, so you can publish your Squarespace-hosted podcast in the iTunes Store. Don’t think Squarespace’s podcast hosting is merely for amateurs. Neutral, the new car show hosted by Marco Arment, John Siracusa, and Casey Liss, is hosted on Squarespace. As I write this, Neutral is one of the top 50 podcasts in the iTunes Store. Reliability and Support — Overall, Squarespace has rock-solid reliability. In the months I’ve been using it, I’ve had a total of maybe 5 minutes of downtime. And thanks to its cloud-based architecture, Squarespace handles surges of traffic without a hitch. Last year, when I was linked to by The Loop, I had a sudden influx of thousands of visitors, and didn’t notice until I checked my usage statistics, because the site didn’t slow down at all. Squarespace takes uptime seriously. During Hurricane Sandy, Squarespace’s New York datacenter lost power. Employees carried fuel up 17 flights of stairs for three days to keep the generator going. Despite the power outage, Squarespace experienced no downtime. Support is also excellent. Although there’s no phone support, email support is available from the configuration page, and is staffed 24/7. I’ve sent support email at 4 AM on a weekend and received a response in minutes. There is also a live chat support option, available Monday through Friday, 11 AM to 7 PM Eastern. @Squarespace on Twitter is also responsive to quick questions. Unfortunately, if your support needs go beyond normal user functions, or involve a bug, the answer can often be “We don’t know.” However, to Squarespace’s credit, their support folks do a fantastic job of following up. I’ve reported bugs that have taken weeks to get fixed, but when they are, I’ve always received an email message to let me know. Even Squarespace’s CEO, Anthony Casalena, sometimes gets involved. After I blogged about some of my Squarespace complaints, he invited me to shoot him an email message. After a lengthy email discussion, many of my issues were resolved. Mobile Apps — One place where Squarespace falls flat is in its support for managing sites from iOS, via the Squarespace app. To be blunt, I don’t trust it. For whatever reason, the iOS app isn’t fully compatible with Squarespace 6. Early on in my Squarespace experience, adding Markdown-formatted posts with the app resulted in unformatted posts, with my Markdown markup visible on the live site. Even now, after Squarespace has fixed some of the issues, problems remain. The most glaring is that when you edit an older blog post in the app, it gets bumped to the top of your feed. So if you correct an error in a month-old blog post, the post will show up on your site as if it were brand new. This behavior is bizarre, as Squarespace’s Web interface doesn’t change posting dates when you edit old posts. To add insult to injury, Squarespace in the meantime has introduced two unrelated iOS apps, Note and Portfolio. Note is a minimalist note taking app that lets you post to Squarespace, Dropbox, Twitter, and other services, while Portfolio lets you view your Squarespace photo portfolios on the go. I won’t go into detail about them here, but it’s frustrating to see them in the App Store when the core Squarespace app itself is broken. My hope is that these aren’t distractions for Squarespace’s iOS developers, but are instead testing grounds for a redesigned Squarespace app. 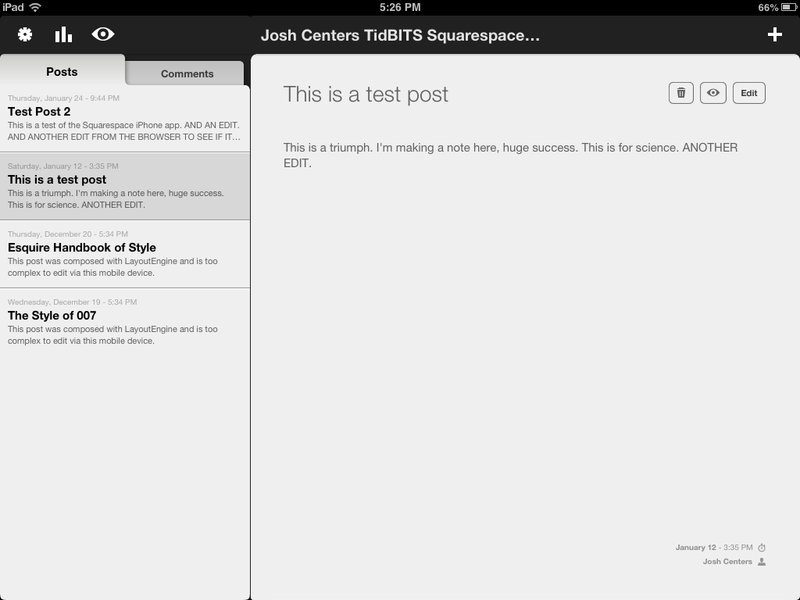 If not for its unreliable editing and posting behavior, the Squarespace app would work nicely. You can access posts, statistics, and settings for one or more Squarespace accounts. I use the app every day to check my site’s statistics. Issues and Complaints — If I have one big beef with Squarespace, it’s that I always feel like I need to wear a hard hat. 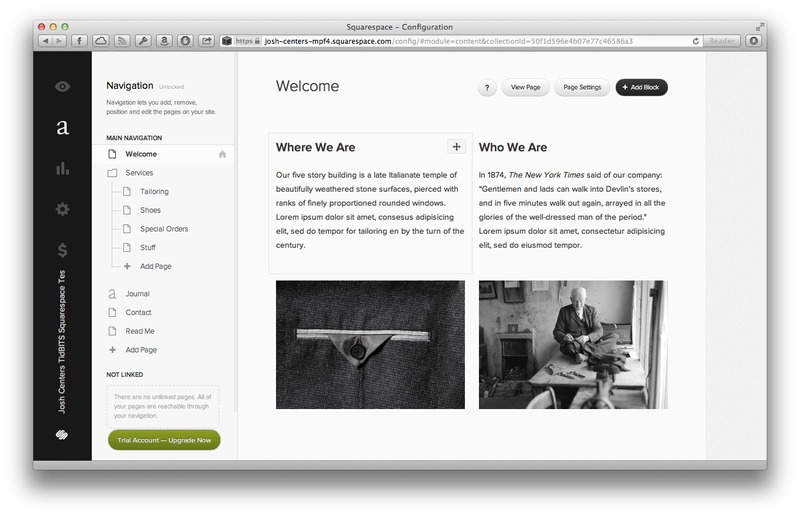 Despite its great design and polish, Squarespace 6 isn’t quite a finished product. Features are added, removed, and changed often, and that sometimes introduces annoying bugs. For example, I used to be able to edit blog entries from a site’s preview, but that feature suddenly vanished, with no notice until I asked for confirmation on Twitter. Along the way, bugs have come and gone. One of the worst was while editing a blog post, moving the cursor would cause the edit dialog to bounce around the screen. This lasted for months, before finally being fixed. Another bug caused my tags and categories to display, despite my setting a preference to hide them. That was embarrassing, because my tags aren’t always as nicely formatted as I’d like. It took over 2 weeks for that bug to be fixed. Another bug that took nearly a month to fix was code injection entries not displaying. 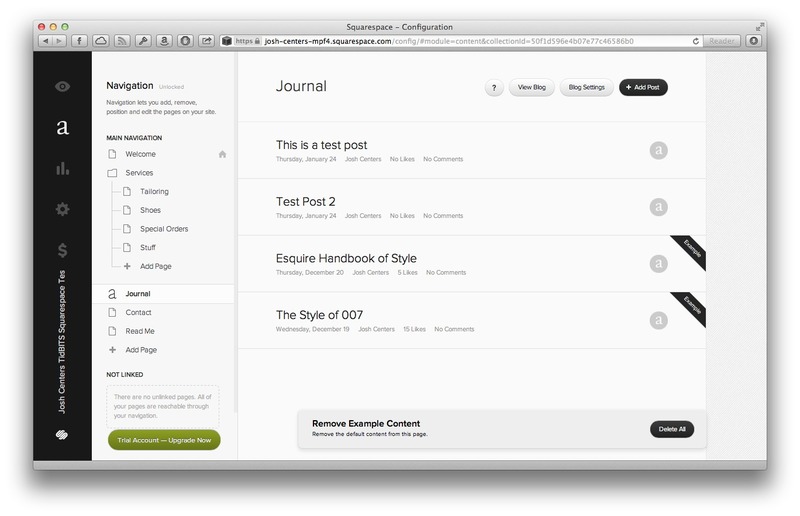 A feature of Squarespace is support for custom code at the top or bottom of a blog post. I had inserted some HTML to add a permanent link to each of my posts, but the link wasn’t displaying. The issue was finally resolved after some back and forth with support, but it nagged at me for weeks before Squarespace fixed it. This is, of course, one of the great failings of cloud-based services. You don’t have to worry about patching security vulnerabilities or otherwise maintaining software, but not all changes are desired or even positive: you always get the bad with the good. And “upgrading,” as it were, is never optional — you can’t decide that you like things just as they are at any given time. This brings me to one of the big downsides of Squarespace: You don’t have total control over your site or even a page. Sure, you can insert custom code in places, and add custom CSS, but in general, you’re limited to the tools that Squarespace provides and the rather limited documentation. So if I want to customize something, I need to poke around in a Web inspector, like those built into Safari and Google Chrome, to figure out how to modify specific HTML elements. There is now an alternative. You can sign up for a developer account, which gives you complete control over your template, with support for CSS, LESS, JSON, and Git. Developer accounts are free while developing your site, but the site is inaccessible to the public until you convert to a paid account. Unfortunately, if you’re like me and signed up for a paid account from the start, there’s no way yet to access the developer account capabilities from a regular account; you have to start from scratch. Even so, Squarespace’s Developer Center documentation is a bit skimpy, so I wouldn’t be entirely comfortable starting with a blank canvas. A sorely missed feature is the lack of RSS statistics. It was a planned feature from the start, and even existed in the earlier Squarespace 5, but it is still achingly absent from Squarespace 6. Sure, you could use FeedBurner, but with some of Google’s recent actions, its future is uncertain. I started my site with a FeedBurner feed, but after reliability problems in September 2012, and an assurance from Squarespace’s Casalena that RSS statistics were imminent, I switched back to Squarespace’s built-in RSS feed. So as of right now, I’m embarrassed to admit that I have no idea how many subscribers I have. It could be dozens, or thousands. If I ever wanted to display ads on my site, this is a major stumbling block. I could switch back to FeedBurner, or another solution, but because I don’t have server-side access, there’s no way to redirect my existing readers to the new feed, making any attempt at migration painful and possibly costing me otherwise loyal readers. For now, for the sake of my readers, I’ve chosen to remain in the dark and hope for the best. Much as I want RSS statistics, an API for third-party developers occupies the top of my wish list. This also was a feature of Squarespace 5 that was dropped. According to Daniel Jalkut, creator of the blog editor MarsEdit, the official reason is that Squarespace 6 is too flexible to work with a standard blogging API. Whatever the reason, it’s annoying. I like to write my posts in BBEdit, but then I have to copy and paste them into Squarespace, which is clumsy. It’s even worse if there’s an image I’d like to include. In that case, I have to split my post into separate Markdown blocks so I can add an image block between paragraphs. Squarespace support in MarsEdit would be great, but what I’d especially like is access to Squarespace’s back end via the command line. That way, I could upload an image to Squarespace from the command line, refer to the file in a Markdown-formatted text file, then upload my blog post from the command line. Then I could tie it all together with an AppleScript that I could launch from within BBEdit. Recommendation — Despite my annoyances and frustrations with Squarespace 6, I love the platform. Maintaining my site is simple, and I’m fond of the design. Unlike say, WordPress, I don’t have to update the base software and plug-ins constantly to plug security holes. And Squarespace is cheap, starting at $8 a month for 500 GB of bandwidth and 2 GB of storage, if you pay annually. You can save an extra 10 percent on a two-year subscription with the promo code GIMME10, and if you sign up through this link, we get a few bucks sent back to us. Sure, there are plenty of cheap hosting companies that offer similar pricing, but many of them have lousy interfaces and spotty service. As long as you’re okay with Squarespace’s limitations, it’s a good deal. While there’s a lot the company needs to improve upon, Squarespace 6 is a young platform with a bright future. It’s what I chose for my personal site, which led to me writing here at TidBITS. Squarespace changed my life. How’s that for a recommendation? Very comprehensive review. I, too, moved from Squarespace 5 to Squarespace 6, and everything you say is spot on. From my perspective, the lack of API support for 3rd-party editors is a fatal flaw in v6 - the web-only editing approach is clunky, doesn't work with some browser add-ins, and requires you to be online. Additionally, if you do try to use an offline editor and past things in, it is very awkward - the Markdown "block" behave differently from the HTML blocks, and adding images & links is difficult in the web UI. I am currently iooking at options for cleanly migrating away from Squarespace (after over 5 years as a loyal customer) because they say the have no plans to add API support back in. That's a shame. Thanks! I agree, if there's one thing that would drive me from Squarespace, it's the lack of a native interface. One option I overlooked in my article is the ability to post directly via email. I could probably rig something up with that, but it's still a pretty limited option. No, I'm afraid not. Squarespace is entirely self-contained. Slightly off the main topic, perhaps, but could you explain the advantages of posting using Markdown, instead of using the native formatting controls? 1. It's what I'm used to. 2. For me, it's faster than using the rich text controls. 3. I can write Markdown in another app, like BBEdit, then copy and paste into Squarespace. This is a great review, thank you! How limiting is squarespace in using ads? I have looked for articles on this and yours is the first to briefly mention it as a downfall. Thank you in advance! Thanks, that's sweet of you to say! I don't know of any limits of placing ads on a Squarespace site. Your only limitation might be finding a good space in a template for it. But adding an ad should be simple, just add a Code Block and paste in the code from your ad network. Excellent article. I'll admit that, other than Matt Neuburg, I haven't been reading much TidBITS lately. But I've been researching what kind of web platform I want to use, and this review was a huge help. Now an article on hosting services which provide features SquareSpace does not (like email) would be great. Thanks again. Josh, any tips or resources for using Markdown and getting images placed where you want them in SS6? I have been pulling my hair out getting them to embed without showing up as full-width images.